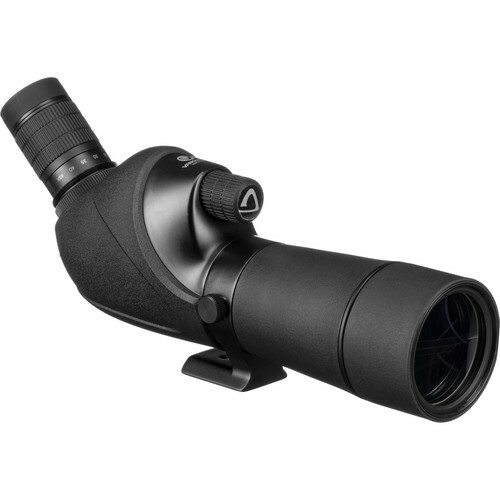 From the forest to the mountains to the concrete jungle, Vanguard designed the 45° angled viewing Vesta 560A 15-45x60 Spotting Scope to provide power and performance to new and experienced users alike for hunting, birding, and general glassing in all environments. Utilizing a generous 60mm objective lens and their Advanced MultiGuard lens coating system boosts its performance in low and challenging conditions while ensuring the views remain bright and clear, even when the magnification is dialed all the way up. Its broad zoom range allows you to enjoy a 104-foot field of view and more easily scan the landscape for targets at the low 15x with the ability to quickly dial up the power to 45x and make detailed observations of distant subjects.